Free Museum Day - A Smashing Success! 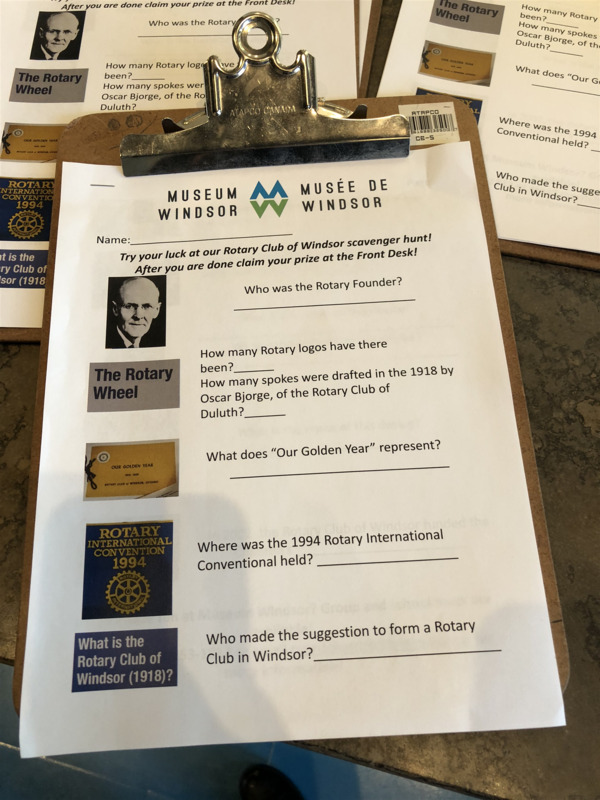 Rotary Club of Windsor (1918) Centennial History Committee organized and sponsored a free day for the community at the Chimczuk museum this past Saturday, October 13th. The Free Day at the Museum was a huge hit, according to museum personnel. Over 350 people from our community took advantage of our Club's sponsored day, which included crafts, a Rotary-themed scavenger hunt (a favourite!) and tours of the Rotary Club of Windsor (1918) exhibit. Thanks to everyone who came out and to all the volunteers (Janet Kelly, Nurlan Turdaliev, Mohamed Moussa, Ed Boycott, Ryan Mancini, Sevda Barin, Maureen Lucas and Colleen Mitchell). Special thanks to the history committee members Anil Chitte and Peter Hrastovec for putting this event together, and to Bev Cyr for the idea!